Are Annual Reports Less Glossy This Year? Call this eating humble pie. I find myself in the odd position of wanting to point out — and applaud — three examples of how the annual report can be used to help convey important messages and further understanding among key audiences about the vital work foundations do around the nation and world, especially in these trying times. In the past, I’ve been among those critical of foundation annual reports, mostly because of the low — if any — return on investment they seem to yield. 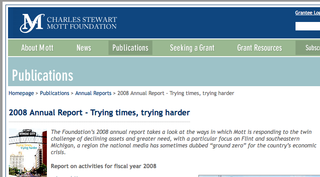 Either I’ve been wrong in making such a blanket criticism or — and hopefully so — the conversations that many of us in the field have been having about annual reports has lead toa rethinking of how they can serve a more strategic purpose and go the extra length to do a better job informing people about the power and promise of philanthropy. It also could be that the tough year we’ve been through has necessitated slightly less “glossy” messages than in the past. The three reports, all selected at random from email announcements I’ve received over the past few weeks, are from the C.S. Mott, Teagle and Hewlett Foundations. In each of these reports, presidents of the respective foundations go beyond the typical year-in-review presentations to deliver compelling messages that are worth reading and reflecting on. 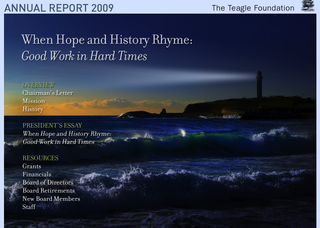 For its annual report, Teagle Foundation President W. Robert Connor writes that “The Big Question for the Teagle Foundation over the past year, as for so many other organizations, has been whether it is possible to do good work in bad times. 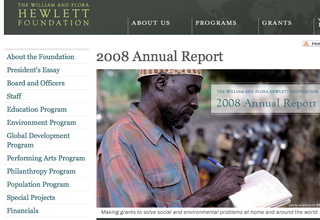 It is refreshing in each of these annual reports — and I presume many others like them being issued this year — to see foundations going the extra effort to raise tough questions, show the work they are doing is meant to address the problems the nation is facing, and also to use the opportunity to shed more light on their inner workings and the thinking guiding their decision making and grantmaking. Of course, messages like these need not wait until the annual report. They should be part of the regular communications from foundations, especially those committed to helping broaden the public’s understanding of the work of foundations.